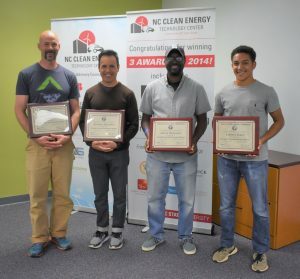 The Training Program for the N.C. Clean Energy Technology Center (NCCETC) has been delivering award-winning continuing education and workforce development trainings for the past 30 years. Participants are able to begin their careers as a North American Board of Certified Energy Practitioners (NABCEP) Photovoltaic Associate, continue their technical education with more advanced classes such as operations and maintenance, or develop their project management skills through Certificate in Renewable Energy Management (CREM). 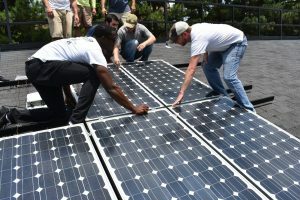 Many students opt to take multiple classes through the unique Renewable Energy Technologies Diploma Series (RETDS), a 120-hour continuing education program geared toward any person wishing to enter the clean energy industry and provides a support network for those looking to expand their careers to include installation, distribution, production, sales and marketing of sustainable energy technologies. The latest group of graduates received their diplomas this past October, which included Francisco Hernandez. Francisco, originally from Mexico and now a U.S. citizen residing in Iowa, started his journey at the Center last September with the REPV: Fundamentals of PV Design and Installation training through our Clean Energy Opportunity Diversity scholarship program. Throughout the past year, he has taken multiple classes and devoted his time to complete the additional hours needed to receive his diploma. In…2013, I worked as a pro bono director for the Valladolid English Library, A.C. (a not-for-profit agency) in Valladolid, Yucatan, Mexico. The city of Valladolid is in the heart of the Yucatan Peninsula and, therefore, a large percentage of the region’s population is Mayan. 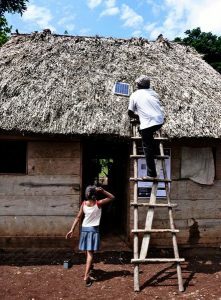 During my tenure at this agency, I encountered, by mere chance, a rural Mayan village located a few kilometers from Valladolid and off the grid [and] I was able to secure donations to purchase three solar batteries for the three stand-alone solar panels installed at the village. Soon after I installed the solar battery and provided simple maintenance to one of the systems, I turned the light switch on and 3 light bulbs [lit up]. I will never forget the faces of the villagers around me. It was at this precise moment when I knew I had to learn more about this technology. A few years after his experience, Francisco found the training program at the Center. He was able to receive the technical training needed to understand how a solar PV system works and is maintained, along with real-world project management skills needed to effectively develop and fund a project. But why the NCCETC? And why the Diploma Series? Sound familiar? The Diploma Series is open to anyone and everyone regardless of background or experience. We would love to hear your story and help start you on your renewables journey whether you’re looking to enter the industry, change your career, install your own solar PV system, or just learn more about something you’re passionate about. Find out more information and sign up for the pathway that’s right for you. The Renewable Energy Technologies Diploma Series is a non-degree diploma from N.C. State University comprised of continuing education programs. The Diploma Series is made up of several workshops that focus on a different renewable technology depending on your interests, but are aimed at providing a comprehensive knowledge base. In order to get a continuing education diploma from N.C. State University’s N.C. Clean Energy Technology Center, a participant will have to complete 120 contact hours through our training programs.